I'm back with another look! I wore it for an entire day...literally. From a 7:30am early wedding, up to about 9:30pm at night after doing a photoshoot meet and greet. The look lasted pretty much all day with just minimal touch-up. I try to keep my own personal makeup separate from my kit. My go to colorful palette is the Barbie Stila Palette which I've mentioned about a million times on this blog. The colors are amazing! 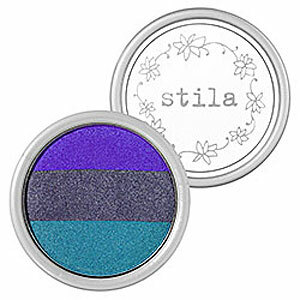 Bright, pigmented, super easy to blend and they last all day with a base underneath them. I went for a really easy look. Purple on the lid, brown in the crease and a highlight color. This was appropriate for the Indian Wedding I did makeup for in the morning, as well as an evening networking function. These pictures show makeup that is still hanging on after about 12 hours! This eyeshadow combo is the basic smokey eye technique...dark lid from the base and fading up lighter to the browbone. Mix it up from the traditional smokey blacks and charcoals and pick a fun color instead. 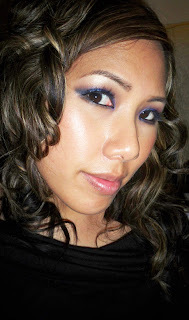 I love doing a purple smokey eye, and it looks great with some blue in there, I'll have to try this.